Werth, A.J. & Allchin, D. [submitted]. "How We Think About Human Nature: Cognitive Errors and Concrete Remedies." Allchin, D. & Werth, A.J. [submitted]. "How We Think About Human Nature: The Naturalizing Error." Presentation (w/ Breno Moura): "Teaching Nature of Science for Scientific Literacy"
Preview: Resolving Disagreement in Science, Chapter 1: "The Challenge of Disagreement". "The Gender of Boyle's Law"
"To Err is Science" [presented at AAAS, 2000, Washington DC]. Allchin, D. [forthcoming.] "From Nature of Science to Nature of Science-in-Society." Allchin, D. [forthcoming]. "From Test Tubes to YouTube: Nature of Science in Socioscientific Issues and History." Proceedings of epiSTEME 6. Mumbai: Homi Bhabha Center for Science Education. Allchin, D. [forthcoming]. "From History to Teaching Nature of Science." Cadernos da História da Ciencia. Allchin, D. [forthcoming]. "Historical Inquiry Cases for Nature of Science Learning." Cadernos da História da Ciencia. Allchin, D. [forthcoming]. "Using Historical Inquiry Cases to Learn Nature of Science Skills." In W.F. McComas (Ed. ), The Nature of Science in Science Education: Rationales and Strategies (rev. ed.). Dordrecht: Springer. Allchin, D. 2018. "Skin Color and the Nature of Science" [guest commentary]. American Biology Teacher 80:163. Allchin, D. 2017. "The Biological Ironies of Transgender Debates." OUP Blog. Allchin, D. 2015. "Correcting the ‘Self-correcting" Mythos of Science." Filosofia e História da Biologia 10:19–35. Allchin, D. 2015. "Context-Dependent Anomalies and Strategies for Resolving Disagreement, A Case in Empirical Philosophy of Science." Pp. 161-171 in S. Wagenknecht, N.J. Nersessian & H. Andersen (eds. ), Empirical Philosophy of Science: Introducing Qualitative Methods into Philosophy of Science (Studies in Applied Philosophy, Epistemology and Rational Ethics 21). Dordrecht: Springer. Allchin, D., Andersen, H.M. & Nielsen, K. 2014. "Complementary Approaches to Teaching Nature of Science: Integrating Student Inquiry, Contemporary Cases and Historical Cases in Classroom Practice." Science Education 98:461-486. Allchin, D. 2014. "From Science Studies to Scientific Literacy: A View from the Classroom." Science & Education. doi: 10.1007/s11191-013-9672-8. Boston Working Group. 2013. "How Can History and Philosophy of Science Contribute to Understanding the Nature of Science for Scientific Literacy? : Mapping Research Needs." Report from the Conference on How Can the HPS Contribute to Contemporary U.S. Science Teaching, Boston Univeristy, Dec. 7-8, 2012. Allchin, D. 2013. "Problem– and Case–Based Learning in Science: An Introduction to Distinctions, Values and Outcomes." CBE–Life Science Education 12:364–372. Allchin, D. 2012. "The Minnesota Case Study Collection: New Historical Inquiry Cases for Nature of Science Education." Science & Education. 21: 1263-1281. Allchin, D. 2012. "Teaching the Nature of Science through Scientific Error." Science Education 96: 904–926. Allchin, D. 2012. "Towards Clarity on Whole Science and KNOWS." Science Education 96:693-700. Allchin, D. 2011. "Evaluating Knowledge of the Nature of (Whole) Science." Science Education 95:918-942. Allchin, D. 2009. "Why We Need to Teach the Evolution of Morality." Evolution: Education and Outreach. SpringerLink DOI: 10.1007/s12052-009-0172-x. Allchin, D. 2009. "The Evolution of Morality." Evolution: Education and Outreach. SpringerLink DOI: 10.1007/s12052-009-0167-7. Allchin, D. 2009. "Teaching the Evolution of Morality: Status and Resources." Evolution: Education and Outreach. SpringerLink DOI: 10.1007/s12052-009-0173-9. Allchin, D. 2008. "Naturalizing as an Error-Type in Biology" Proceedings of the Sixth Brazilian Conference for the History and Philosophy of Biology. Sao Paolo: Mackenzie University. Allchin, D. 2007. "Efraim Racker." New Dictionary of Scientific Biography. Allchin, D. 2007. "Albert Szent-Györgyi." New Dictionary of Scientific Biography. Allchin, D. 2007. "Albert Lester Lehninger." New Dictionary of Scientific Biography. Allchin, D. 2007. "Alex Benjamin Novikoff." New Dictionary of Scientific Biography. Allchin, D. 2007. "Teaching Science Lawlessly." Pp. 13-31 in Constructing Scientific Understanding through Contextual Teaching, Peter Heering and Daniel Osewold (eds. ), Berlin: Frank & Timme. Allchin, D. 2006. "Wallowing in the Wastebin" [review of John Losee's Theories on the Scrap Heap]. Science 311(Feb. 10): 781-782. Allchin, D. 2006. "Why Respect for History--and Historical Error--Matters." Science & Eduction 15:91-111. Allchin, D. 2005. "Discovering the Self." In Carolyn Schofield (ed. ), 2005-2006 Professional Development for AP Biology. New York: College Entrance Examination Board. Allchin, D. 2005. "The Dilemma of Dominance." Biology and Philosophy 20:427-451. Allchin, D. 2004. "Appreciating Classic Experiments." In Carolyn Schofield (ed. ), 2004-2005 Professional Development for AP Biology. New York: College Entrance Examination Board. Allchin, D. 2004. "Error and the Nature of Science." ActionBioscience [online]. Allchin, D. 2004. "Should the Sociology of Science Be Rated X?" Science Education 88: 934-946. Allchin, D. 2004. "Pseudohistory and Pseudoscience." Science and Education 13: 179-195. Allchin, D. 2003. "Lawson's Shoehorn, or Should the Philosophy of Science Be Rated X?" Science and Education 12: 315-329. Allchin, D. 2003. "Scientific Myth-Conceptions." Science Education 87: 329-351. Allchin, D. 2002. "Dissolving Dominance." In Mutating Concepts, Evolving Disciplines: Genetics, Medicine and Society, L. Parker and R. Arkeny, eds., Kluwer. Allchin, D. 2002. "To Err and Win a Nobel Prize: Paul Boyer, ATPase and the Emergence of Bioenergetics." Journal of the History of Biology 35:149-172. Wivagg, D. & D. Allchin. 2002. "The Dogma of 'The' Scientific Method." American Biology Teacher 64:484-485. Allchin, D. 2002. "Tapping into the Pulse of History." ActionBioscience (online). Allchin, D. 2001. "Error Types." Perspectives on Science 9:38-59. Allchin, D. 2001. "Kettlewell's Missing Evidence, a Study in Black and White." Journal of College Science Teaching 31:240-245. Allchin, D. 2000. "How Not to Teach Historical Case Studies in Science." Journal of College Science Teaching 30:33-37. [variant text]. Reprinted in The Pantaneto Forum 7 (July). URL: www.pantaneto.co.uk/issue7/allchin.htm. Allchin, D. 2000. "Mending Mendelism." American Biology Teacher 62:632-639. Allchin, D. 1999. "Negative Results as Positive Knowledge, and Zeroing In on Significant Problems." Marine Ecology Progess Series 191:303-305. Allchin, D. 1999. "Teaching Darwin Seriously: Addressing Evolution and Ethics." American Biology Teacher 61(May): 350-55..
Allchin, D. 1999. "Mendel's Mistake?" BioQuest Notes 9(2): 1-7. Allchin, D. 1999. "Values in Science: An Educational Perspective." Science & Education 8:1-12. Reprinted pp.185-196 in Science, Education and Culture: The Role of History and Philosophy of Science, Fabio Bevilaqua, Enrico Giannetto and Michael Matthews (eds. ), Dordrecht: Kluwer Academic Publishers; adaptation reprinted in International Handbook of Science Education, B.J. Fraser and K.G. Tobin (eds. ), 2:1083-1092, Kluwer Academic Publishers. Allchin, D. 1999. "Thinking about Technology and the Technology of 'Thinking About'." Techne 5:7-17. Goodyear, G. and Allchin, D. 1998. "Statements of Teaching Philosophy." To Improve the Academy 17:103-121. Allchin, D. 1997. "James Hutton and Coal." Cadernos IG/UNICAMP 7:167-183. Allchin, D. 1997. "Rekindling Phlogiston: From Classroom Case Study to Interdisciplinary Relationships," Science & Education 6:473-509. Allchin, D. 1996. "Points East and West: Acupuncture and Comparative Philosophy of Science," Philosophy of Science 63: S107-S115. Reprinted in Philosophies of Science, Jennifer McErlean (ed. ), Wadsworth (2000). Allchin, D. 1996. "Cellular and Theoretical Chimeras: Piecing Together How Cells Process Energy," Studies in the History and Philosophy of Science 27: 31-41. Allchin, D. 1996. "Teaching Respect for Life." HSUS/NABT Symposium on the Dissection Controversy, Charlotte, NC (unpublished presentation). Allchin, D. 1995. "Points East and West: Acupuncture and Teaching the Cultural Contexts of Science." In F. Finley, D. Allchin, D. Rhees and S. Fifield (eds. ), Proceedings, Third International History, Philosophy and Science Teaching Conference (Minneapolis, MN, 1995), 1:23-32. Allchin, D. 1994. "The Super-Bowl and the Ox-Phos Controversy: Winner-Take-All Competition in Philosophy of Science," in PSA 1994 1:22-33. Allchin, D. 1994. "James Hutton and Phlogiston," Annals of Science 51: 615-35. Allchin, D. 1993. "Of Squid Hearts and William Harvey," The Science Teacher 60(#7): 26-33. Allchin, D. 1992. "How Do You Falsify a Question? : Crucial Tests v. Crucial Demonstrations," PSA 1992 1:74-88. Allchin, D. 1992. "Phlogiston After Oxygen," Ambix 39: 110-116. Allchin, D. 1992. "Simulation and Analysis of Information-Center Foraging," Behaviour 122: 288-305. Allchin, D. forthcoming. 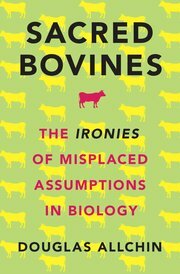 Sacred Bovines: The Ironies of Misplaced Assumptions in Biology. New York: Oxford University Press. Allchin, D. 2013. Teaching the Nature of Science: Perspectives & Resources. St. Paul, MN: SHiPS Education Press. Finley, F., Allchin, D., Rhees, D. and Fifield, S. (eds.). 1995. History, Philosophy and Science Teaching (Proc. 3rd Intl. Conf. ), (Minneapolis, MN: University of Minnesota). Allchin, D. (ed.) and Minnesota Teachers. 1997. Teaching History and Nature of Science: Curriculum Modules. Minneapolis: The Bakken Museum and Library. contents online. See also Teaching Portfolio Handbook [website at the Univ. of Texas at El Paso]. "William Harvey and Capillaries" (Jan., 2005) 67:56-59. "Genes 'R' Us" (April, 2005) 67:.244-246. "Hands-Off Dissection?" (Aug., 2005) 67:369-374. "The Ironies in Labeling Genetically Modified Food." Star Tribune (Jan. 26, 2016). "Letter of the day: One winner? It doesn't have to be that way." Star Tribune (May 2006). "Better parents?" Star Tribune (Aug. 5, 2006). "Save the mice!" Minnesota Daily (Dec. 14, 1999).